In March 1926 Bernard was presented with this certificate by the Temperance Band. 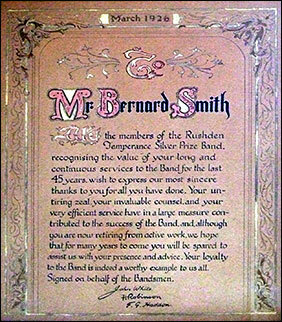 We the members of the Rushden Temperance Silver Prize Band, recognising the value of your long and continuous services to the Band for the last 45 years, wish to express our most sincere thanks to you for all you have done. Your untiring zeal, your invaluable counsel, and your very efficient service have in a large measure contributed to the success of the Band, and, although you are now retiring from active work, we hope that for many years to come you will be spared to assist us with your presence and advice. Your loyalty to the Band is indeed a worthy example to us all. Signed on behalf of the Bandsmen. Bernard Smith was born at Dodford, and probably came to Rushden to work in the shoe trade about 1888. In early 1890 he married Emily Bettles, from Wymington, and they lived in Manton Road. Their first daughter Florence E was born at the end of that year, two years later Doris E was born, followed by a son Edwin B, and Ethel E in 1899. In 1891 Bernard joined the Temperance Band, and enrolled his son Edwin when he was just six years old into the band. Edwin known as "Ted" also did long service with the "Temps" for over 50 years. Bernard died in January 1937, and was buried in Rushden cemetery, grave F761, aged 67. Emily survived him by more than 20 years and died in 1958 aged 90. Precious memories of a beloved husband and father Bernard SMITH who passed away January 10 1937 aged 67 years. Life's race well run, life's work well done. "Now cometh rest". Also of Emily Annie SMITH beloved wife of the above died March 19 1958 aged 90 years. In heavenly love abiding.